This was once a skimpy post with a few small screenshots from the Cameron Diaz-Kate Winslet movie The Holiday. 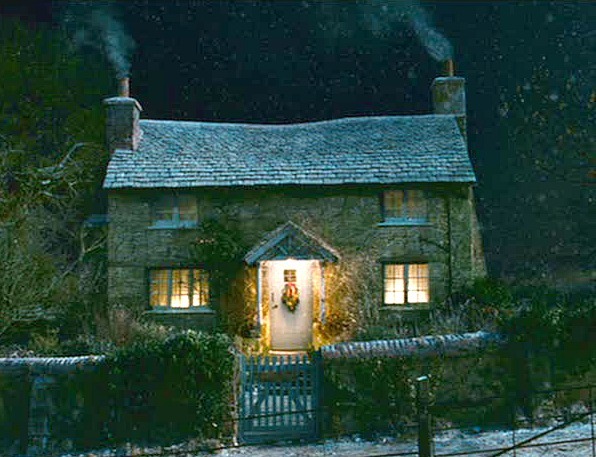 I have since devoted three separate posts to all the fabulous houses in the movie because I decided they deserved them. I haven’t seen this movie but oh my gosh, that London home makes me want to go rent it! Your button just reminded me I have to get a house tour ready. Eeek! That was fun, thanks! I haven’t seen this movie yet either, but if I can vote on the actors (not their characters), I say “ew” and “ick”. They’re probably the most likely reason for my avoidance of the movie, even though I’ve always been so intrigued by the interior shots I’ve seen. One of these days soon, I’ll watch it for the houses. Just saw this movie again, not long ago. I love to see the movie, just to have another look at the sets! I love oldy-worldy houses, but I actually voted Amanda’s house on all votes but the library. Very tasteful, light and airy. away home just for husband and me. I liked this movie, Not the best piece of film but I love Christmas feel good movie and this one is that. I actually just bought it this year on black friday, and have yet to watch it this year. Trust me the village where this is set is called Shere and it’s in Surrey. You can’t get anything under £400,000 there is no way a writer could live there unless she was JK Rowling 😉 It’s stockbroker belt land. Have a google – the houses there are AMAZING! The Wedding Date was also set there. Iris’s house reminds me of the little cottage used in Sense and Sensibility. Something inside me says that it’s not the same one, but still…..they look sooo similar!!! But if it were the same one, then that would mean that Kate Winslet was in two movies with the same house. this was one of the greatest movies! I love jack black, though. thanks for moseying on over to my property for a little looksy yesterday. Hope all is well with you and yours! I am drooling over Iris’ cottage. It’s so cosy and warm. Amanda’s is nice, you know, if you’re into space and modern conveniences and all, but it’s a little cold. I just want to grab a book and a cup of strong tea and curl up at Iris’ place. I want both houses, Jack Black’s character, Jude Law’s looks, and and I’m guessing Iris’s house was her parents’ before her, and that’s how she can afford it. This is a fun post! I love that movie! Looks like the cozy home of Iris is the most popular with your readers! I like her style too. That was hard…I needed a both button a couple of times. I’d need to watch the movie again before I could pick Jack or Jude’s character. I take your polls way too seriously, huh? This was one of my favorite movies! One reason being for those houses. I love them both, but Cameron’s California house was to die for! I even painted my media room chocolate brown after seeing this movie. I love all the photos you found. I’m coming back here for more decorating ideas later. I think I’m in the minority according to the votes about the favorite houses. I want to live in the big one and vacation in the cottage. If I’m remembering correctly, Iris inherited that house from her parents or Grandparents. It’s why she travels so far to get there from work, it’s been in the family for generations. Oh and Jude Law (the character) is to die for also! yum. I love the girl’s room. Where is that here??? Hi – thanks for the shout out! These two are my favorite house movies ever! I can not wait for her new one to come out next year!!!! Can’t wait!!!!!! LOVE how you did the voting on this blog! I’m totally in love with the English cottage! The cottage makes me want to curl up and read a book, but I can’t imagine cooking a big dinner in the small kitchen. I like the English bedroom and the contemporary bathroom – can I split my vote? I watched this last night! Even though the acting is not the best, I really love this show. It has some pretty redeeming qualities and has been added to my list of “must watch every year” Christmas movies. I love the homes, the two little English girls (Graham’s -Jude Law’s character- daughters), Graham himself (sorry, I can’t help but think he’s pretty!) and Arthur and his friends. Cute show, perfect for this time of year. Thanks, guys, for explaining how Iris got that house! I apparently was too busy staring at the sets to catch crucial plot points like that. Ha. oh my goodness..iris use to spend her summers with her darling grandma… she was the only relative who gave this sweet person the time of day..when she died she left the house to iris…of course the grandma had squirreled away quite a bit of money which also went to iris…much to the greedy dismay of other children and grandchildren…after taxes iris was able to decorate the house in the amazing style we all love…i have never seen this movie so all of this might not fit at all with the character…but this is what the house tells me when i walk through those wonderful rooms…. I’m with all those on how Iris got Rose Cottage: family. I haven’t seen this show and now I want to if for nothing more than to die over that cottage house. Love the pictures. Fun post-thank you! I never did see that movie and after your review don’t think I will either. I always enjoy my visits to your blog! Hope you are having a nice day! I wanted to see this movie but my usually sensitive hubby doesn’t like chick flicks. I’m renting it though because I want to see more of these houses- even if they’re not real. But at least I get to see the good parts here! I love the little quizzes…and all the answers were IRIS!!! I love the comfortable feeling of those better. I love both houses, I guess it’s my Gemini nature! And the new button for the House Tour is adorable. I can’t wait until it stops raining here so I can go out and take my pictures! I like both houses, too. I love the coziness of the cottage, but I like the style of the newer one, especially the bedroom and bath. I first saw the movie with 2 friends who thought I was mad NOT to have wanted Amanda’s house! No way…I WANT the one Iris has. It is glorious!!! Thank you for this Julia!! 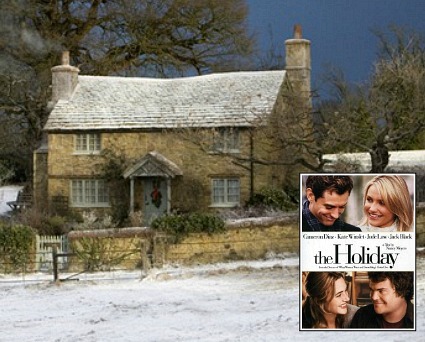 I have never seen this movie, but now I am going to buy it because I am in love with that cottage!!!! Oh my!!! I am a TOTAL Iris! Oh my, I’m so late to this post. I’m not sure I’m in love with either of these houses. Each is just too extreme for me. I love Iris’s cozy home and appreciate all the effort you went to to give us a side by side look and a chance to vote. Just a quick thought on how Iris afforded her home. Did you notice that her brother’s place wasn’t too shabby either? Book editors don’t make that much unless they are truly high-powered. I think the answer was implied by Jude Law’s character when he mentioned coming from a family long involved in writing and publishing — there’s a bit of “old money” floating around to help with the expenses of daily life. I have been browsing your blog this morning, it is wonderful! I’m hooked! I love this blog! This is one of my favorite posts. This was a great movie too. I am a new viewer to your website and I was browsing the “Housesitter” page when I realized that stairs reminded me of Amanda’s House in The Holiday and I am so excited that you have this on here! Hi! I found your blog when I was searching for pictures from the movie The Holiday, and was thrilled when I found your blog. I just love the movie, I have of course bought it and can watch it over and over again. I love the interior design and have plans to copy some of them, but I have unfortunately not such as big house as Amanda. I live in Sweden in a apartment in Stockholm. Do you by any chance know anything about the painting in the hall over the sidebord, the beautiful dress? Thank you for a very nice blog, Helena. .-= Helena´s last blog ..Have2Have =-. I originally saw this movie because I absolutely love Kate Winslet and Jack Black but I fell in love with that cottage and watch it over and over again, just for the house. Now I just come back here to enjoy it. I’m trying to evoke that feel in my own home but I’ve only got about 1200 square feet to work with. Do you know any websites for help with extremely small house decorating? Both houses are truly amazing but the English cottage is the winner! Sooo glad I found your blog and this post! .-= House Painting Tutorials´s last blog ..Home Color Design – Home Color Scheme =-. Ok, I can see I am posting this really late…..I just love this site! Happened to find it when looking for photo’s from this movie, how fun! Nice to know I’m not the only one who watches this movie over and over. I love the Cottage, it is simple and adorable. I dream to have a fireplace like the one in Iris’s cottage in my next home…..
“dreams are nothing more than wishes, and a wish is just a dream wished to come true”…. Jude Law, Jude Law, Jude Law! Anyone know who painted the white dress with the dark red background that hangs in the foyer of Cameron Diaz’s house in The Holiday? Many thanks! This little cottage is BY FAR my favorite movie house. I want it! I love all the stone and homey touches! .-= Juju at Tales of Whimsy.com´s last blog ..Contest- Superhero Needed =-. I am late to the party. I just saw this movie today, 11/7/10. I can’t believe they cast Jack Black in this part. What a mismatch. All I could think of was that Kate Winslet must be a great actress! I keep trying to think of someone who would have been a better love match for her but I guess I don’t know the young actors. On another note, you may disagree but Amanda’s morality seems to be lacking. Gosh, where did you find all your photos?! I wish I’ve found this blog sooner because I’m totally obsess with romantic comedy’s houses. My fave is Sandra Bullock’s character, Lucy, apartment in While You Were Sleeping. Have you blog about it? If not please, please, please do. Meg Ryan’s character, Kathleen, apartment in You’ve Got Mail is nice too. So was It Could Happen To You. Oh, I love this blog! I love “While You Were Sleeping.” I covered it here: https://hookedonhouses.net/2008/12/09/while-you-were-sleeping-christmas-in-chicago/. Iris’ cottage, Amanda’s bathroom, and Jude Law! Tough call (on the guys anyway). Jude Law’s character is more attractive and just as sensitive as Jack Black’s, so I’d just LOVE to mix the two (Jude’s looks and Jack’s raucous sense of humor). As for houses, I’d go with Iris’ cottage. Those who mentioned how expensive Surrey is are right. I looked into it, as I’d like to retire to England (maybe not after the last couple weeks, though!) but it seems my price range would be in Devon or Dorset (not bad spots either). 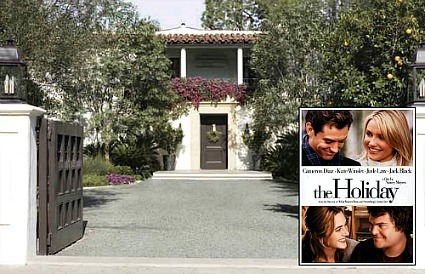 For a GREAT LA house, try Adam Sandler’s and Tea Leoni’s gorgeous yet homey Westwood place in “Spanglish” (have you ever covered that one here? ).